Since the Ford Ranger disappeared from the U.S. market in 2011, it’s been remembered by many as the quintessential “honest truck.” Cheap, lean, purely utilitarian. In 2019 it’s coming back, ostensibly on the same platform used by the current Ranger abroad. So we spent some time with a 2016 truck it to get an idea of what our “new Ranger” might be like. This particular Ranger is a temporary legal guest in the United States courtesy of the aftermarket association known as SEMA. SEMA arranged for the truck to be brought to California so American companies could develop upgrade parts for it to be sold abroad. We were invited to check out the truck by Gibson Exhaust, a Corona, California-based outfit which makes pipes for all kinds of vehicles but specializes in trucks and SUVs. They’d already fitted this Ranger with their own exhaust system which gave the truck a little extra auditory presence, but otherwise the vehicle was stock. 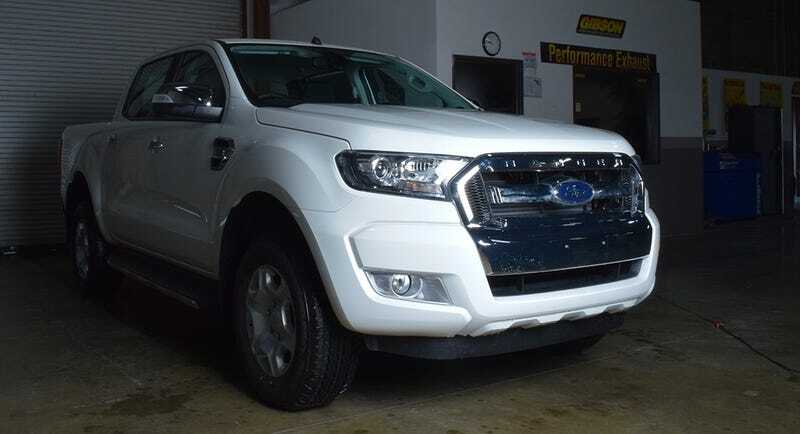 It’s a 2016 XLT four-door crew cab, built in Thailand for the Australian market. As optioned with a six-speed automatic transmission, 3.2-liter inline-five-cylinder engine and four-wheel drive this truck would retail for AUD 62,789 which translates to about $47,000 American. But before you freak out, you’ve got to realize everything’s expensive in Australia. The same four-door 4x4 3.2-liter automatic XLT Ranger retails for just 1029000 Baht in Thailand; which is $29,000. The Ranger we’ll be able to buy in America in 2019 will be built in America and undoubtedly be priced competitively with its mid-sized competitors here, namely the Chevrolet Colorado and Toyota Tacoma. The Honda Ridgeline is of course the “softer” more compliant alternative as the only unibody vehicle in the category, and the Nissan Frontier is a bit of a wildcard since it hasn’t been revised since 2005. I’ve got to imagine it will probably undergo a major revision before this “new” Ranger hits the American market. But the Ranger’s here now. At least, this one is. So let’s walk through what we learned after climbing all over it for half a day. We’ve already done the geometry to dissect how big the current Ranger really is compared to other mid-sized trucks, and even considered how it measures up to a modern F-150. I see a lot of complaints in comment sections about today’s “mid-sized” trucks being enormous, and they certainly are bigger than they were when we last had a new Ranger, but half-ton trucks have grown proportionately. A 2017 F-150 with a four-door cab, which seems to be what everybody wants now, measures 231.9-inches tip to tail with a 5.5-foot bed. It can also be spec’d with an extra foot of cargo space. A four-door Ranger is almost two whole feet shorter at just about 211-inches in total overall length. Practically speaking, the truck feels extremely manageable. Especially in comparison with a full-fat F-150. The whole hood’s in easy view, and there’s no need for a battery of cameras to figure out where the truck ends in any direction. The bed is modest, and would need to have its gate down to hold a dirt bike but the space looks plenty usable. The bed in this 4x4 spec-truck felt pretty far from the ground, but the cabin was a lot easier to climb into than an F-150's. No retractable bedside steps required. The “tallest” variant of today’s Ranger has about nine inches of ground clearance, for the record. Inside the Ranger feels snug from the driver’s seat. The center console is tiny and you’ll definitely be brushing up against your passenger if you’re both wearing big coats. That said, there was plenty of leg room for me in the back seat even with the driver’s in a comfortable position for six-foot tall person. The ergonomics on the truck felt easy and intuitive enough. The only thing that tripped me up was the reversal of the blinker and windshield wiper switch, but that’s only because the Australian truck was, of course, right-hand drive. I would have liked a lot more bolstering in the seat, though. This XLT’s cloth buckets didn’t have a lot of padding or support. The infotainment situation was also extremely basic, just a little screen in the center and a tiny calculator-like display between the main gauges. But I think we’ll get a lot more gadgetry in most U.S.-spec trucks. Internationally, the Ranger is available as a single, extended and four-door crew cab but I bet the single cab does not make it back to America for 2019. I don’t want to extrapolate too heavily from my hour of puttering around Gibson’s industrial complex, and we had to keep the truck on private property lest we violate the EPA’s terms of letting it visit America, but I did have some observations. The first thing I noticed was the weight of the steering. There was much more resistance in the wheel than I would have expected. While the helm in an F-150 or even a new Super Duty pickup is light as a feather, this Ranger’s didn’t feel like it had much power assistance at all. The chassis seemed firm. The truck didn’t want to roll much in a casual steering. Playing slalom in the rainy parking lot made the Ranger feel more liable to slide than tip, for what it’s worth. I also noticed the front end didn’t lift much when I mashed the throttle. Where a new Tacoma will rear up on its haunches if you boot it from a stop, this Ranger just kind of plodded ahead. That could indicate the Tacoma has softer suspension, but it may also have something to do with the Ranger’s diesel inline-five probably being heavier than Toyota’s V6. As for power, it’s probably hardly worth discussing since the 3.2-liter diesel in this truck would need a completely different particulate filtration system to be legal in America. But since I know you’re curious, the engine’s rated to 185 horsepower and 350 lb-ft of torque. And it was most certainly not in a hurry to get anywhere until the accelerator had been pinned for a good few seconds. We really have no idea what engines will be available with the U.S. Ranger in 2019. I suppose the most educated guess would be the revamped 2.7-liter EcoBoost turbo V6 and new 3.0-liter Power Stroke diesel making their debuts in the 2018 Ford F-150. This Ranger felt very similar to what I remember the 2.8-liter Duramax diesel-powered Chevy Colorado was like. In terms of both acceleration and interior proportions. I do believe the Ranger’s hood seemed a little shorter, at least from the driver’s perspective. This Ranger’s steering certainly felt much heavier, and the whole truck felt a lot stiffer than a Tacoma. I also felt that this Australian-spec truck’s “basic trim” seemed significantly more spartan than the Colorado’s base specification. The cheapest Colorado WT I ever drove had more supportive cloth seats and prettier screens, even though they were modest and limited in function. It’s important to keep in mind that these impressions of the 2016 Ford Ranger are not necessarily applicable to the U.S.-spec truck we’ll have in a couple of years. The performance and driving dynamics could feel dramatically different with different engines and suspension tuning. But apparently the chassis, shape and styling we’re looking at here, with the exception of the front bumper, is pretty much what we’re going to get. The most valuable insight here is probably the sense of scale and proportions, which are mostly that, yes, it does feel a lot smaller than an F-150. I also think it’s safe to assume the American-market truck will be loaded with a little more tech beyond this Ranger’s Nokia phone-style screen and parking sensors. After spending some quality time crawling all over the 2016 Ranger I’m left with the sense that the 2019 will be a good little truck, but it will not be the cheap and tiny pickup you remember from ten years ago. The Ford Ranger is coming back!